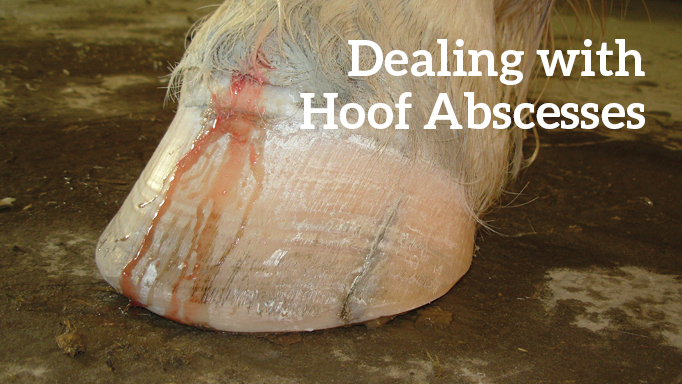 Lea Riddell, DVM, explains how to deal with different types of hoof abscesses. My horse is suddenly three-legged lame! What could be wrong? Every equine veterinarian is familiar with this kind of call: an owner goes out to do the morning feed and finds a severely lame horse that can’t bear any weight on one leg. The client is in a panic, fearing the worst – a broken leg or a life-threatening injury. But those same signs could indicate a less serious, but still painful, problem. A hoof abscess is a pocket of infection that develops underneath the sole or within the sensitive tissues (laminae) of a horse’s foot. As infectious pus builds up, the growing pressure causes a great deal of pain for the horse. Horses often develop hoof abscesses during the late winter or spring when there’s a lot of melting snow or mud. 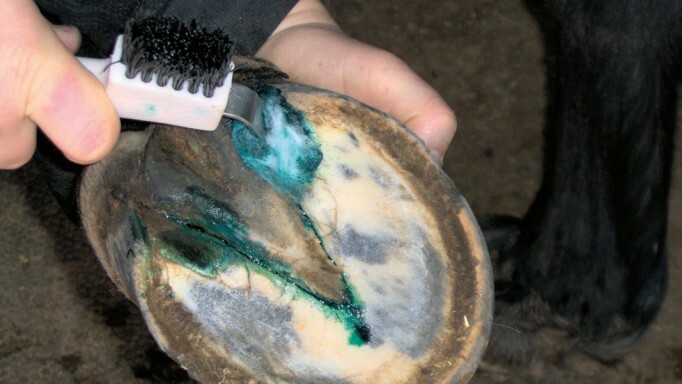 Moist environments cause horses’ hoofs to soften and bacteria can more easily enter through cracks in the hoof wall. As well, horses diagnosed with laminitis or other diseases that affect the health of the hoof wall are more prone to hoof abscesses. Since severe lameness could indicate a catastrophic injury, the first step is to call your vet so the problem can be accurately diagnosed. Keep the horse in an enclosed space (a stall or small paddock) until your vet arrives. Radiographs, or x-rays, will help to rule out a fracture as the cause of lameness, and if the pocket of pus is visible on x-rays, the images can help to pinpoint the abscess’s location. In some cases, hoof abscesses can be difficult to find, which makes them challenging to diagnose. There are a few methods we use to help localize the horse’s discomfort. 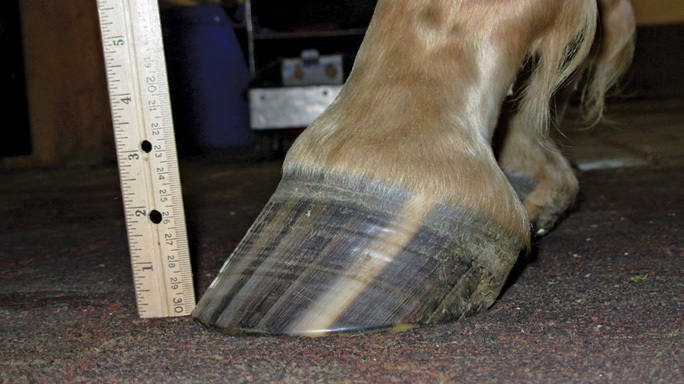 Hoof testers can be applied to the horse’s hoof to determine if there are any sensitive areas that may indicate the location of the abscess. 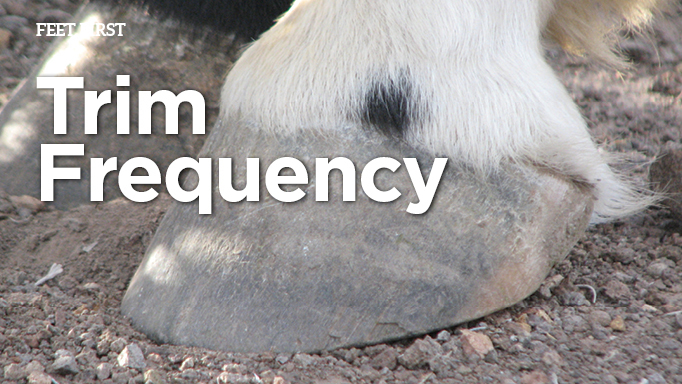 Horses suffering from a hoof abscess will often be repeatedly sensitive or reactive to a specific area with hoof testers. We can also perform nerve blocks to help localize the source of pain by desensitizing certain parts of the horse’s leg, starting with the foot. If we still can’t find the location of the abscess, we move on to x-rays. A pocket of pus may show up as a dark circle or shape on the radiograph, guiding us to the source. In other cases, we can examine the horse’s sole and find a draining tract – very thin black lines that lead to the pocket of infection. By following the draining tract, we can use a hoof knife to open and drain the abscess. We gently pare down the sole to reach the abscess, but we need to be cautious. If we dig too deep and cause bleeding, that can lead to further infection and slower healing. In some cases, we may ask the horse’s regular farrier to dig out the abscess since he or she is more familiar with the horse’s feet. Ideally, we want to open the abscess through the bottom of the foot, and as the pus drains, that relieves the pressure, and thus, the pain. Soaking the horse’s foot in warm water with Epsom salts for 20 minutes once a day can help to draw out more infection from the abscess. Next, bandage the foot with a medicated pad (a pre-made poultice) and use a duct tape boot or hoof boot to protect the area from dirt and mud. In the winter, when it’s too cold to soak the foot, we put a wet poultice on the foot, covered with a bandage. We recommend that the owner repeat the process once a day. Because an abscess is so painful, we suggest keeping the horse in a stall or a small paddock so it doesn’t have to move far to reach feed and water. There’s no easy answer to the length of treatment; it depends on the severity of the abscess. If we can find the draining tract and we’re successful in draining the abscess right away, it will probably take about five days of treatment. If we can’t find the draining tract or the abscess on x-rays, but we’ve ruled out everything else, it can take a week, 10 days or even longer for the abscess to rupture, drain and heal. In severe cases, a horse can develop cellulitis – an infection under the skin that travels up the affected leg from the hoof that is accompanied by swelling and heat. There may also be an elevated digital pulse in the affected leg. Hoof abscesses don’t always come out of the bottom of the foot; they can also come out of the horse’s coronet band or heel. Cellulitis often develops with these cases. These kinds of abscesses also tend to take more time to heal because it takes longer for the abscess to rupture and for the opening to seal up. You can try to prevent hoof abscesses by making sure your paddock or pastures have good drainage and schedule regular visits with your farrier. However, even horses that have well-managed feet can develop hoof abscesses due to trauma, such as a puncture wound. They are frustrating to deal with, but on the other hand, most clients are very relieved to hear that an abscess is causing their horse’s lameness versus a fracture. It’s the lesser of two evils. Dr. Lea Riddell is a resident in equine field service at the Western College of Veterinary Medicine (WCVM). She graduated from the college in 2016. 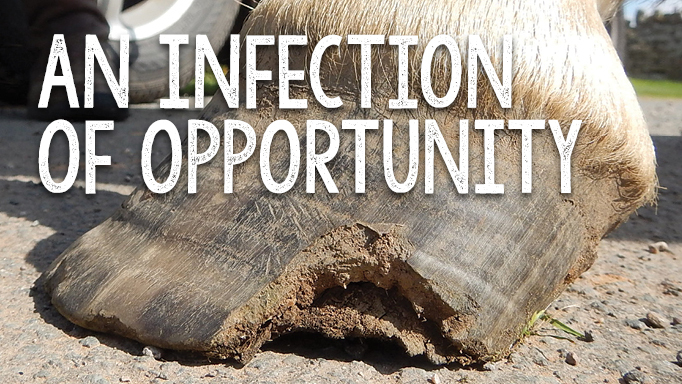 Learn how to detect white line disease, a sneaky infection that can afflict any horse. How Often Should a Horse’s Feet be Trimmed?